The line between realism and fantasy continues to be tested in certain superhero movies, notably with independent films that look at their budget and production constraints as challenging opportunities instead of burdens. While some like Chronicle and Midnight Special possess monumental other-worldly powers that only emerge at specific points, others tailor their content toward using as little "magic" as possible -- if any -- perhaps integrating small flickers here and there while telling largely dramatic stories. Sleight pulls that gap tighter together with its tale of street magic, electromagnets, and a bright and promising urban kid who resorts to unsavory business methods to help provide for his family. An observant, captivating eye for visual language and measured character development intertwines with JD Dillard's grasp on a foreseeable, yet absorbing growth of tension, but the preposterous leaps in common sense required to get Sleight out of tough situations pulls it down when and where it really matters. 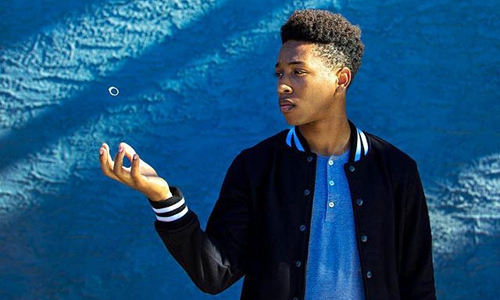 Dillard's film also deserves recognition for standing out as a portrayal of a black "superhero", directed into the story of Bo (Jacob Latimore), a late-teenaged street magician in Los Angeles. His promising scholastic future and dedication to sleight of hand gets derailed upon the sudden death of his mother, leaving him as the sole caregiver for his sister, Tina (Storm Reid). As with many artists, the income for being a street performer doesn't quite cover the bills, which leads him down the path of selling drugs for local dealer Angelo (Dule Hill). Bo's passion isn't for money or the life of drugs, though, but remains with the allure of magic, to such a degree that he's modified his body so that he can project magnetism through his arm through a complicated, dangerous, and entirely homebrewed mechanical network. Everything goes smoothly enough for Bo, even with the potential for a budding romance with an admirer, Holly (Seychelle Gabriel), but his proximity to the life of crime finally begins to catch up with him, forcing him to use his tools of deception and magnetism in other ways. In no way does Sleight rush through its development of Bo and the conditions of his challenging, yet rewarding way of doing things, capturing his satisfaction during performances on the streets with attentive cinematography, allowing the audience to absorb his craftiness and natural glow. Dillard offers a portrait of the young man that smartly emphasizes the highs and lows of his days, even going so far as to add levity to his network of drug-dealing, showcasing the variety of "regular" people with which he associates and adding an acceptable degree of normalcy to what he's required to do. The seeds for suspense and supernatural elements are planted throughout, as well as how he'll use sleight of hand for more nefarious purposes, but Sleight needs for its audience to embrace the context of the young boy's disrupted life before moving forward with those. There's a stiff, transparent comic-book style rhythm to the dialogue, but Jacob Latimore's faintly solemn, attractive performance succeeds in drawing those watching into how Bo makes his life work while continuing to follow his passion for magic. Sleight focuses so intently on the drama involved with Bo's day-to-day that the mildly fantastical elements of his body modification come close to feeling tacked on, but the way in which Dillard does so still grasps onto a degree of meaningfulness, justifying its supplemental position in the story. Throughout, the dangers of the drug-dealing culture incrementally close in on Bo, forcing him down paths of violence that he reluctantly accepts to maintain the status quo with his living situation. These on-the-nose aspects of Bo being involved with the Los Angeles drug-dealing lifestyle are counterbalanced by the mystique and mild body horror involved with his incremental modifications to his arm, integrated into his pursuit for more awe-inspiring -- and lucrative -- tricks he can have literally up his sleeve. At his core, Bo wants to get out of that way of life and impress others with his passion, which adds a unique spin to the fairly routine progression of his "ascent" in that other world, which, admittedly, is given gravitas by Dule Hill's measured, menacing performance as drug lord Angelo. Unfortunately, the title Sleight also inadvertently covers the substance of the film's dramatic and suspenseful buildup, hitting recognizable and unadventurous notes while events take shape into a (super)hero origin story of sorts. Between the progression of Bo's relationship with Holly, which echoes the Peter Parker and Mary Jane tempo from Raimi's Spider-Man in crucial ways, and the run-of-the-mill escalation of his interactions with Angelo's drug-dealing syndicate, writer/director Dillard doesn't take many risks in the chronicles of his protagonist before he fully taps into his quasi-supernatural capabilities, despite dropping in a few sharp, unflinching actions that accentuate the impact of what's going on. Dread does incrementally grow throughout Sleight as the dangerous aspects of the criminal underbelly maneuver around Jacob Latimore's sympathy-earning street magician, but the moving parts all channel toward a blatantly foreseeable climax, partly because of the script's design but also due to the limited options at Dillard's disposal because of the emotional corner he's written Bo into. Sleight has bigger issues to contend with, though, in how it attempts to stay as plausible as possible through the introduction of Bo's increase in power and application of his fantastical abilities. Director Dillard may hit speedbumps with foolish decisions made on Bo's part, inviting problems upon himself only partially justified by his desire to leave behind the drug business behind, but the magnitude of the street magician's control of metallic objects using his self-made electromagnetic arm truly complicate matters. That's largely because the film takes such a raw, moderately authentic approach to his life that these embellishments of science -- effectively turning Bo into a nascent, good-guy version of Magneto -- collide with the grounded happenings beforehand, especially in the chaotic and violent final act that, yet again, can't resist stealing other films' X-factors for its potency. In trying to stay bound to reality while mixing the struggles of urban survival and the magic of magnets, Sleight attempts to both sell its realistic illusion and lean upon suspension of disbelief, and those sides instead up repelling against one another.